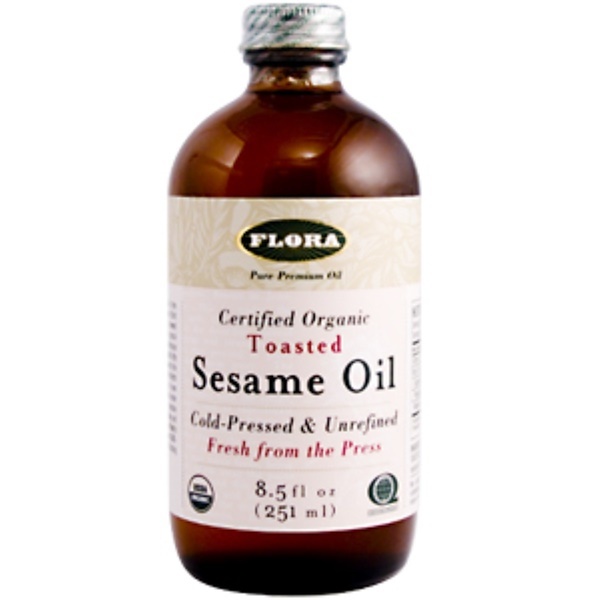 Flora's Toasted Sesame Oil is from certified organic sesame seeds (third party certification). Utilizing our newest pressing method based on a special European Hydro-Therm technique brings a full spectrum of essential fatty acids and a rich sweet nutty flavor to the oil in a way that is unprecedented in North America history. The oil has been carefully bottled in light-resistant amber glass with a nitrogen-flush to maintain optimum freshness, prevent oxidation and ensure maximum nutritional value. Flora's Toasted Sesame Oil is guaranteed GMO-free to ensure the safest, best tasting cooking oil. Flora's Toasted Sesame Oil is perfect for sauces, stir-frying, and baking. It also adds a delicious flavor to salad dressings. If using for deep frying, heat oil gradually to prevent foaming. For optimum freshness, keep refrigerated and use within 12 months after opening. Organic Toasted Sesame Oil. Nitrogen-flushed to maintain freshness.